Near the township of Buchan, lies a honeycomb of caves full of spectacular limestone formations. Buchan Caves were formed by underground rivers cutting through limestone rock. The formations are created by rain water seeping through cracks and dissolving some of the limestone. As each droplet comes through the roof it deposits calcite which crystallises in a small ring. In time, stalactites are formed on the roof of the cave, and stalagmites build up from droplets which fall to the floor. The Reserve was established to cater to the needs of the thousands of visitors who visit the caves each year. Spend time in the Visitor Information and Interpretation Centre and learn more about our natural and cultural heritage. Visit the caves. Guided tours are conducted daily in Royal Cave and Fairy Cave. Both caves are lit and have concrete pathways. 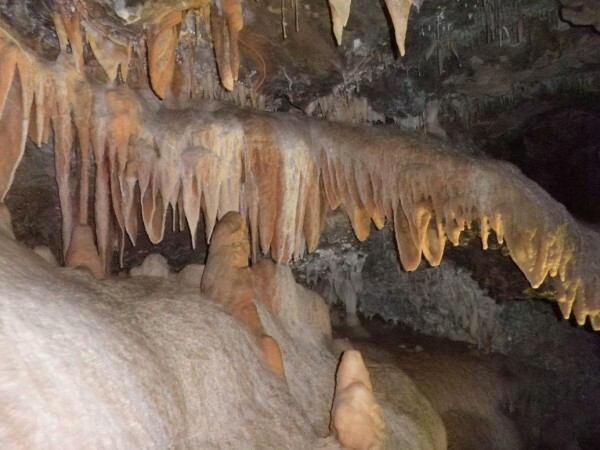 Royal Cave features beautiful calcite-rimmed pools; Fairy Cave features elaborate stalactites and stalagmites. Special cave tours (some of which involve donning a helmet and light) for small groups are offered during the school holidays and amy be organised by prior arrangement. Walk the Spring Creek Track (90 minutes return) or try the shorter walks in the area. Swim in the pool fed by a natural spring. The Reserve has a swimming pool, playground, walking tracks, picnic ground, toilets, and Visitor Information and Interpretation Centre. Light snacks and refreshments are available at the Visitor Centre. There are 49 powered and many more unpowered campsites. Booking is required at Christmas and Easter school holiday periods. Fully self-contained units are also available and bookings are required all year round. Guided cave tours operate regularly every day except Christmas Day. Guided cave tours may be booked in advance for large groups organised by schools or coach companies. Motel and cabin accommodation is available in Buchan. The caves were reserved in 1887, though largely by accident - they were on land set aside for stock camping. The government commissioned an exploration soon afterwards and reserved the land to protect the caves. In 1907, Frank Moon discovered the Fairy Cave which was opened to the public later that year. Royal Cave was discovered in 1910 by Frederick Wilson and after an entrance tunnel was excavated, it was opened to visitors in 1913. The Caves Reserve was set out and planted mostly in the late 1930s. Buchan Caves Reserve is home to many native animals including the Eastern Grey Kangaroo. More than 60 species of birds have been sighted in the reserve. Hundreds of deciduous trees and native trees have been planted in the Buchan Caves Reserve. Pets are not allowed in the Reserve. Buchan Caves Reserve is 360 km from Melbourne, north of Lakes Entrance (Melway ref: 529 D3). From Bairnsdale, drive to Bruthen and take the Buchan Road. Book your next Holiday Online. Visit our Lakes Entrance Accommodation page, showing 100s of Accommodation providers in and around Lakes Entrance to select from. You can also browse our Boat Hire offerings for the Gippsland Lakes. Be your own skipper and Hire a Boat to cruise at your own leisure. For further information go to Parks Victoria web site.